Due to the lack of muscle control, babies are constantly swinging their arms and hands. It is important to keep their nails trimmed to prevent them from scratching themselves in the face. Never try biting or tearing your child’s nails. If the idea of bringing scissors or nail clippers anywhere near your baby’s fingers causes you to feel anxiety or fear, then our list of the ten best baby nail clippers will be perfect for you. 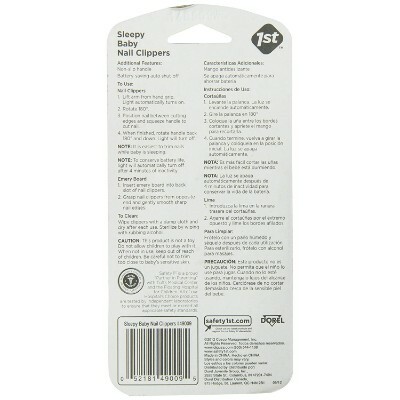 Our list is composed of nail scissors and clippers that are designed specifically to trim baby's nails. As you read through our list, it will be clear that with any of these clippers you will be able to relax and enjoy the process of trimming your child’s nails. With your baby’s safety being our main priority, we recently updated this list to ensure that you were choosing from the best available products. Any products that were out of stock were removed and replaced. 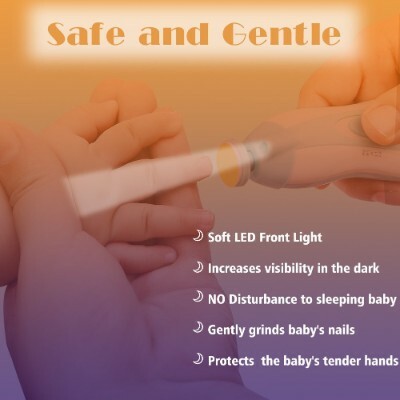 This comes with everything a parent needs to successfully clip their baby’s nails; it includes a long-life battery and a portable nail file that can be easily stashed away in its own compartment when not in use. The large cushioned handle is great for manual dexterity and a firm grip, which plays an important role in the prevention of accidents. The rounded front edge makes more sense than a purely horizontal blade for the best possible trim. For all these great features, you really can’t beat the price! 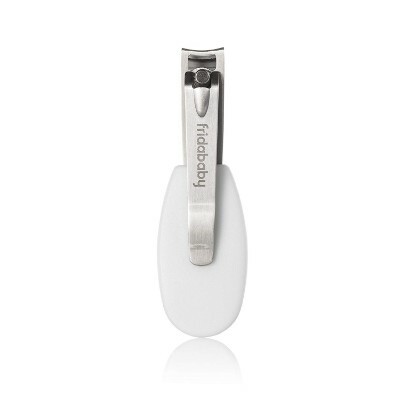 The built-in light and long-lasting battery make this the perfect on-the-go baby nail clipper. 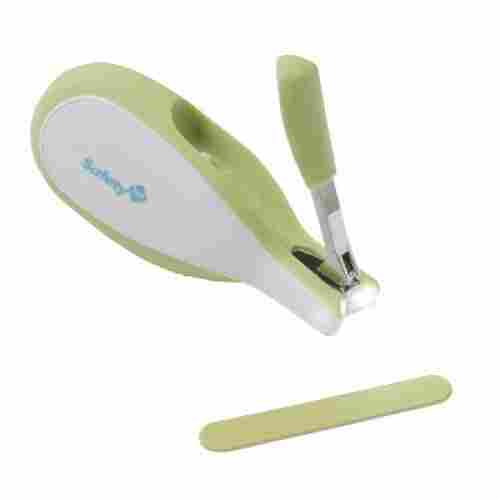 Not only can you trim their nails, but you will also be able to file them as this clipper comes with an emery board. Furthermore, the clipper is designed with a slot that allows the file to be stashed away when not in use. In addition to the front head is rounded, the clipper blades themselves also have a slight arc to them for a more exact trim. The bonus nail file allows you to quickly and easily refine those bothersome edges. Don’t feel bad about requisitioning this tool for a little mommy pampering time after taking care of your little one. 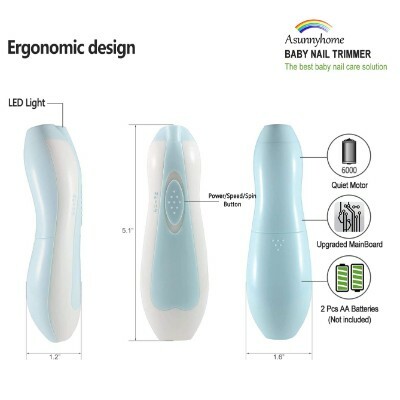 The Baby Nail File Electric Nail Trimmer Manicure Set by Consevisen is designed to support nail maintenance for both you and your little one. . Two AA batteries provide you with electric grinding speeds up to 5000 revs/min to give your baby a swift but thorough trimming. There is no concern of friction burns due to inaccurate filing thanks to the 2mm foam cushion on each head which protects your little one’s cuticles and delicate nail beds. Proper nail maintenance is very important during your baby’s first few months as they have a tendency to scratch themselves. Recent studies suggest that using mittens to prevent facial scratching can inhibit the development of fine motor skills. One of the best times to trim your baby’s nails may be while they are asleep. This trimmer has a built-in front LED light to supply and its whisper-quiet motor is also ideal for night trimmings. The gentle filing motion and vibration can be soothing to your little one while awake as well. With no loud noises to disturb or frighten them, you will get the perfect trim every time. This trimmer also allows you to adjust the rotating direction and speed for different hands to give corner to corner filing coverage. 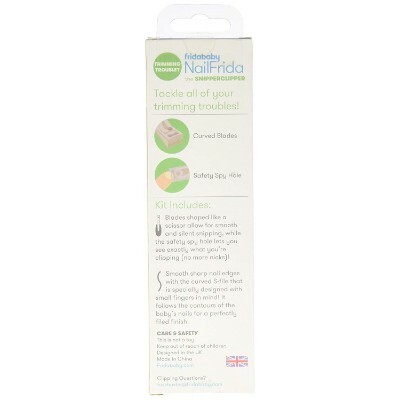 Another popular electric nail file on the market, this one by Little Martin’s Drawer is suitable for all ages, not just babies. 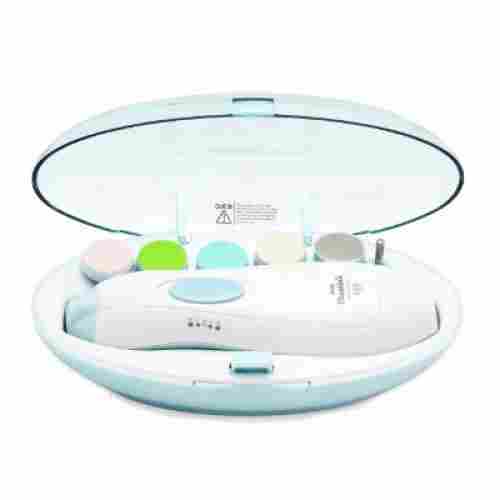 This product combines the very best of speed and painless application with easy, straightforward operating functions. Just one button controls all the different settings, which thankfully takes out all the unnecessary guesswork. With its sleek and discreet carrying case, it’s easy to tote this one around when traveling. This one comes with a handy LED light in front for effortless use while the baby is sleeping, and the whisper-motor will never wake them up. The varying directions of rotation and speed allow you to achieve rounder and more lustrous nails, all while making the experience pleasant and stress-free. The different types of nail files are color-coded according to your baby’s age, which acts as a helpful guide when wondering which one to use. It even comes with three charming animal stickers as a special gift for your little one. When your little one is first born you will want to kiss those perfect little fingers and perfect little toes over and over again. Those little pinkies won’t stay perfect forever and eventually, their nails will start to grow. Infants retain the desire to ball up for the first few months of their life and this can put those nails dangerously close to the delicate skin of their face and eyes. In the past mother’s would mitten their little one’s hands to prevent them from accidentally injuring themselves. While these tiny tot gloves are still a viable option for more enthusiastic babies, most scratching issues can be resolved with proper nail maintenance. The Tweezerman Baby Manicure Kit provides you with all the tools you will need to trim and file your baby’s nails from infancy through toddlerhood in one convenient, durable package. While an infant’s fingers are often too little and too fragile to trim with clippers, the stainless steel scissors with this set are the perfect size to gently remove the excess nail. Tweezerman is well-known for the high-quality adult nail and facial care products and they have taken care to continue this tradition of quality over quantity with their baby nail care line. The double-sided nail file is a gentle buff perfect for rounding off snags and rough nail edges that can catch on your little one’s clothing. 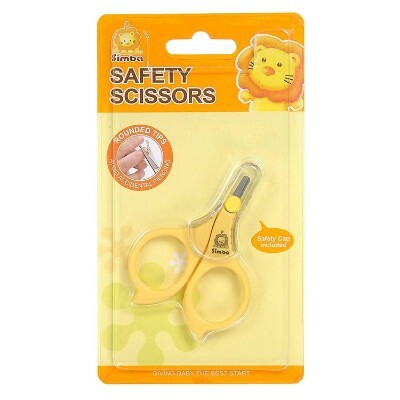 So many moms have horror stories of when they accidentally cut their baby’s delicate fingers while trying to trim their nails using cumbersome adult scissors. Does your little one put up a fight every time you try to trim their nails? Wait till they’re fast asleep, and then use the illuminated LED light that lets you do the job without interference.
. This electric nail file does all that and more, allowing you to choose four different speed and rotation levels that deliver a safe, quiet and stress-free experience. Parents love the fact that they can use it on themselves as well and experiment with all the useful features. We love that even the adults can benefit from this handy electric clipper, which means the whole family can experience a calmer nail grooming session together. The four different motor levels and six types of file material make it easier than ever before to keep your baby’s nails in tip-top shape without ever having to break out the band-aids. The awesome thing about this product is that it can also be used by adults just as easily! In fact, it comes with three filing heads that are specifically meant for adult use. Priced under ten dollars, these scissors are highly affordable as they are designed to survive long after your child grows out of them. 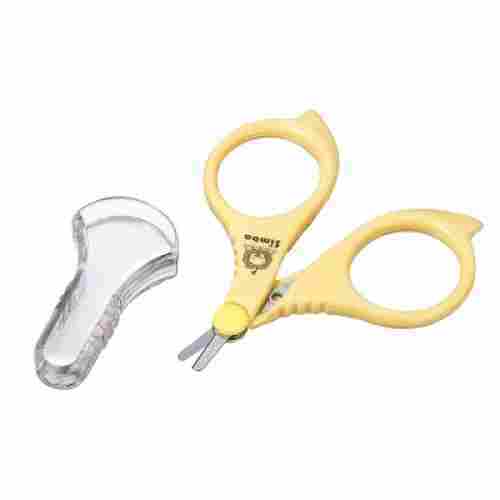 The small size of these scissors makes it easy for you to include them in any diaper bag. The tips cut the nail without bending it, thus ensuring your child’s nails will continue to remain healthy and strong as they grow. The rounded edges will allow you to cut your child’s nails safely and receive a precise trim. 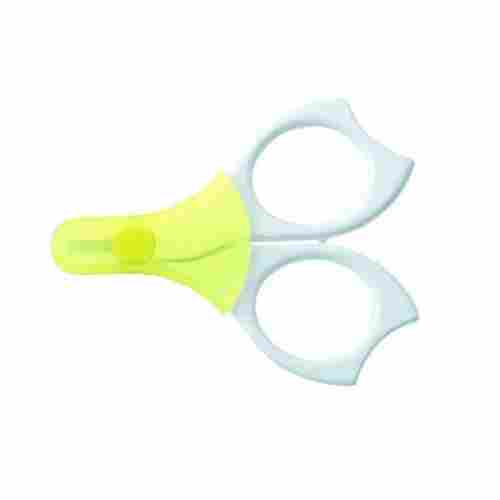 The compact size and protection case makes these scissors very easy to transport. Along with the scissors, you will receive a protective case that is designed to slide over the tips of scissors when they are not in use. 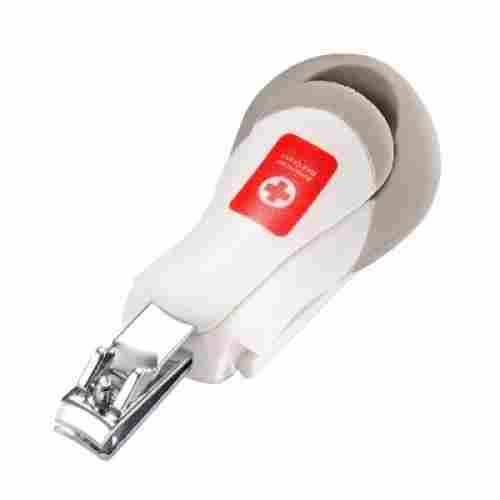 Backed by the American Red Cross, this is more than just your average nail clipper. Not only is it specially manufactured to fit your baby’s nails precisely, but it’s also made of high-quality stainless steel that won't dull over time. The unique plastic handle is designed with comfort in mind, which is why it boasts an almost cushion like shape for the adult hand. With this handy magnifying glass, you’ll get a perfect trim every time, and will never have to worry again about accidental nicks due to poor visibility. The magnifying glass is also foldable so that you can adjust it out of the way when needed. It’s hard enough straining your eyes when trying to see your baby’s tiny nails, which is why you’ll love the fact that this clipper comes with an elevated magnifying glass that is positioned directly above the stainless steel clippers. This great deluxe nail clipper is suitable for newborns as well as older babies. This gives you more leverage when maneuvering around your little one’s fingers, and the additional rubber grip on the handle prevent slips and fumbles. A number one best seller on Amazon, this clipper set by Fridababy has a lot to offer the busy parent. When you purchase this modernized clipper set, you’re getting not just a clipper, but a nail file as well for even more ways to safely maintain your baby’s nails. And although these may seem bigger than your average pair of baby nail clippers, there’s a good reason for it; its slightly larger build means that adult hands can more easily sustain a tight grip, versus trying to hold onto tiny clippers that can easily fall out of large hands. Clipping your baby’s nails doesn’t have to be a dreaded event thanks to this clippers safety hole that lets you carefully monitor every move you make around your baby’s delicate nail bed. Curves are the name of the game with this clipper; the clippers themselves are designed with a slight arc, and the accompanying nail file has an S-shaped form which both allows you to achieve as close a trim as possible to the nail bed. This is much better than blunt nail clippers because the curve mimics the natural arcs of your baby’s fingers. The unique curved design of the blades also provide a more safe and smooth trim. The patented spy hole is easily this clipper’s most notable feature as it allows you to see exactly what you are clipping. Newborn nails can be very difficult and daunting to try to cut. They are softer and thinner than normal nails and can even retain the same color as your little one’s surrounding skin. Some mothers opt for filing or even biting their newborn’s nails to keep them from accidentally scratching themselves. These methods can leave jagged and sharp edges, however, and your baby may still scratch themselves. 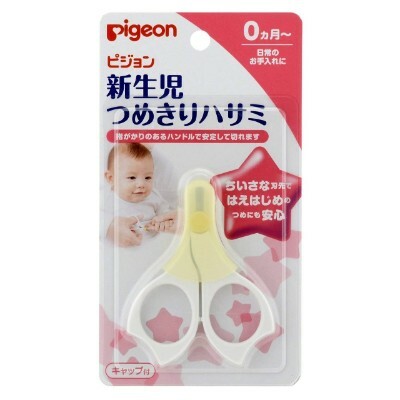 Pigeon’s Nail Scissors are the best way to provide your little one with full, corner to corner nail trimming and prevent accidental scratching. These blunt-nosed blades are made of high-quality carbon stainless steel. The short blades will slice through your little one’s nails with ease without damaging their cuticles or nail beds. The handles are tough enough for adult hands and can hold up even when trying to wrangle a wiggling toddler. While these blades are only recommended for the newborn stage, many parents state that they continue to use these scissors up through the toddler years to provide a quick way to trim feisty fingers! The short blade length can also provide you with a sense of confidence that you are not going to snip your baby’s fingers. They also come with a blade cover to protect your little one against accidental grabs. The Rubis Baby Nail scissors is the perfect combination of practical and adorable. 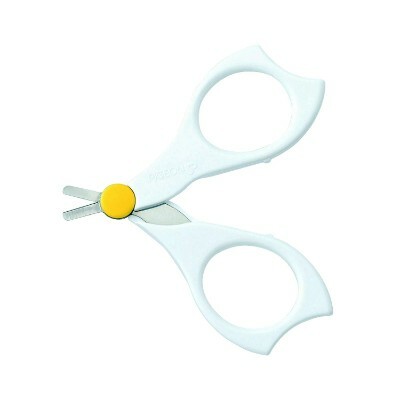 These scissors are composed of stainless surgical steel making them highly durable. Included with the scissors is a leather pouch that is designed to look like an elephant. The pouch, also known as elephantine, serves as storage for when the scissors are not in use. The blades have been rounded, thus allowing you to receive a precise cut without nicking your child’s skin. With the scissors in the pouch, you can toss them in your diaper bag without worrying about them poking you when you go digging for something else. With such an adorable design, this can be your go-to baby shower gift. As you cut your child’s nails, there will be nothing blocking your view as the tips are small. The high-quality leather and stitching of the pouch will allow it to hold these scissors for years to come. 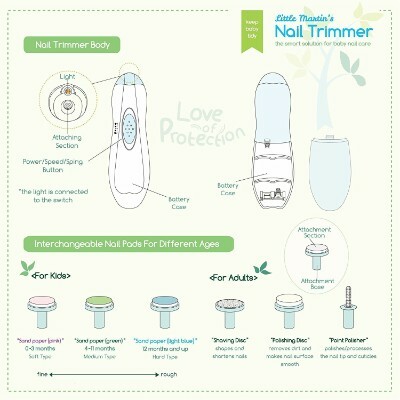 The kid-friendly design will make the nail trimming process less intimidating and scary for kids. Why go with an old clunky pair of nail clippers when you can buy a better pair that will end up making the whole process easier? The baby nail clippers on our list aren’t your ordinary clippers. Every single one has unique details that turn it into a multi-functional tool you can’t live without. From illuminating LED lights, various speeds and rotation levels to rounded clippers that hug the nail bed, these nail clippers offer special extra features that enhance their productivity and performance. An ordinary nail clipper just doesn’t cut it when it comes to trimming your baby’s nails, so we wanted to find ones that had a little something extra to offer today’s busy parents. Modern families require modern tools, and your baby’s nail clipper should be up to today’s newest standards. A modernized baby nail clipper is safer and more reliable than older styles, and their innovative details even make it possible for you to be more creative in your approach. Your baby’s fingers and nails are so small that it can be terrifying to try and clip them; it almost seems impossible not to make a mistake! But that’s where our awesome list comes in. We searched high and low for clippers that take the stress out of nail clipping. Today’s baby nail clippers are made to give you, the parent, more options and control over your baby’s nail care. The baby nail clippers on our list were selected for their modern methods and techniques that make a world of difference. Prevent accidents and ease the anxiety for both you and your baby by getting one of these trusted models. Even the manual baby nail cutters on our list have a reputation for being some of the best on the market because of their simplicity and uncomplicated construction. We’ve come up with the best selection of baby nail clippers that are easy to use and hassle-free. A baby’s skin is extremely delicate and prone to injury at this early stage in life. 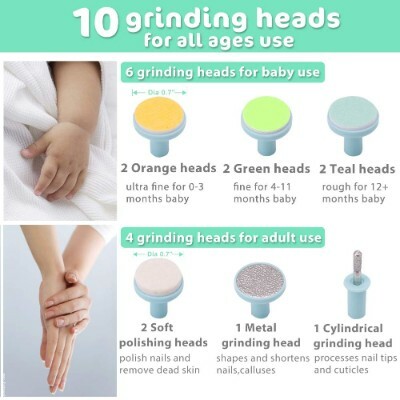 Parents have unfortunately underestimated how easily their baby’s skin can be scratched, which has resulted in many accidents when trying to clip their baby’s nails. 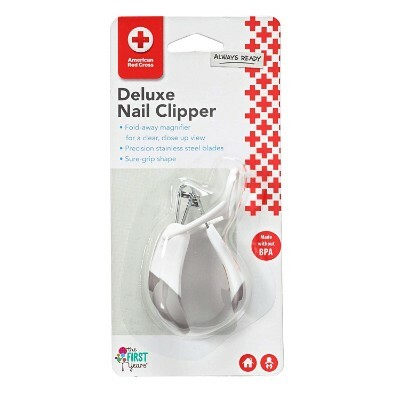 We felt that it was important to find baby nail clippers that were safe for both the baby and the parent in order to ensure the best possible results. Being a parent is stressful enough without having to always worry about nicking your baby’s fingers. Our list features cutting-edge safety features like ergonomic handles, safety holes, magnifiers, and curved blades. q: My baby hates getting her nails trimmed, what are the best clippers for a non-cooperative baby? You’re not alone; it seems to be the majority of babies hate getting their nails clipped, and it’s easy to understand why. If the wrong type of nail clipper is used, an ordinary routine can suddenly turn into a traumatic experience for the baby. You can avoid all this by purchasing a nail clipper especially suited to babies with a higher sensitivity to nail care. 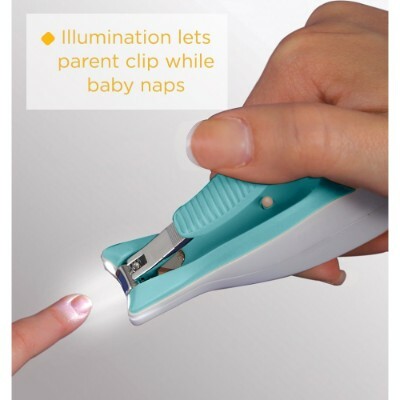 In this situation, most parents prefer to use an electric baby nail clipper because they allow you to quickly file your baby’s nails when they are fast asleep. Our list features several electric baby nail clippers for you to choose from. q: Which is better, using a nail file or a traditional clipper? This really depends on what your baby prefers, and whether they are overly sensitive to the nail care routine. A baby nail file is great for babies who become anxious or nervous because it is much more gentle than a regular nail clipper. Scared babies seem to handle a nail file better because there is no actual "clipping" going on and no possibility of nicks. However, many parents have had luck finding a traditional nail clipper that is designed to be extremely gentle and non-threatening to the baby, and we feature some of these on our list. A traditional nail clipper is able to remove sharp hangnails much easier than a nail file, and also does a better job of trimming straight across the nail bed. q: Can these baby nail clippers be used on older children? They certainly can! Several of the baby nail clippers on our list have all been used successfully on both older children and adults. Many parents have mentioned in Amazon reviews that they bought one of these clippers specifically for their 8 or 10-year-old, and have been using it regularly with great success. The electric baby nail files on our list are suitable for the whole family and even come with extra filing grits that are meant only for adult use. q: Are the filing grits included with the electric clippers too rough for a baby’s nails? No; the wonderful thing about these electric nail clippers is that they all come with a handy guide that tells you exactly which filing grits should and should not be used on your baby. Most of them come with up to six different types, so being able to distinguish between them is crucial. The filing grits that are clearly labeled as being suitable for your baby are designed to be super-soft and gentle to minimize any discomfort or irritation. The older the baby is, a corresponding filing grit may be used according to the product guidelines. q: Is the whisper-motor on the Little Martin’s Drawer file completely silent? Although it is not completely silent, the whisper-motor is as close as it gets to a noiseless motor. Hundreds of happy parents have found this to be the only way they are able to safely clip their baby’s nails, and because babies are naturally such deep sleepers, the whisper-motor isn’t even noticed. The other electric baby nail clippers on our list have a very similar quiet motor that is designed to be barely audible to your sleeping baby. This innovative feature is considered to be a lifesaver by many parents who would otherwise have to resort to constantly wrestling with their screaming baby. Try it for yourself and you’ll be glad you did! q: Is an electric nail clipper easier to use than a manual one? To answer this question, one would need to observe the temperament of their baby and how well they respond to getting their nails clipped. To make the nail care routine easy and stress-free for everyone involved, it’s important to choose the appropriate nail clipper for your unique situation. Does your baby start to cry everytime they see you get out the nail clippers? 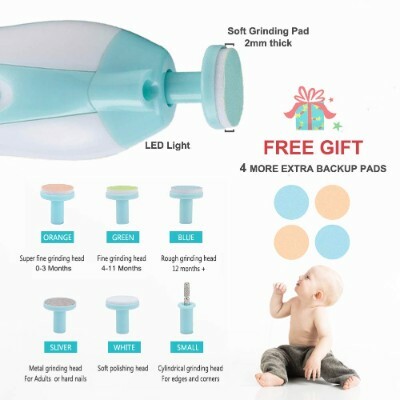 Then you may have better luck using an electric baby nail clipper because of its many time-saving features and its ability to be used when your baby is asleep. If your little one has no problem with getting their nails clipped, then you can probably stick to the less expensive manual nail clipper, and we feature several great options on our list.